Yet, in spite of my best efforts to the contrary, it still looks great and functions like a dream. When you buy a brand new pre-seasoned cast iron skillet, all you need to do is rinse it out in hot water and dry it completely by placing on your cooktop over medium-high heat. Make sure the entire surface is dry before putting away because cast iron can and will rust if water is left sitting on its surface. If your seasoned cast iron cookware loses its sheen for whatever reason, you may need to re-season it to get it back into tip-top shape. If you search online for how to re-season a cast iron skillet, you may be a bit overwhelmed by all the different points of view out there regarding the best methods and types of oil to use. For example, there is a lot of debate about what oil to use due to the different smoke points associated with each type of oil and the release of unhealthy free radicals caused by using oils with too-low smoke points. As a result, flaxseed oil is often suggested as an ideal oil to use due to its high smoke point. Leave pan in hot oven for at least an hour. Turn oven off and allow the skillet to cool completely while still inside the oven. If the coating isn’t as consistent as you’d like when you take it out of the oven, repeat this process until the desired sheen is achieved. As you can see, it IS possible to restore a cast iron pan or skillet that has seen better days. (My own beloved skillet is proof of that!) 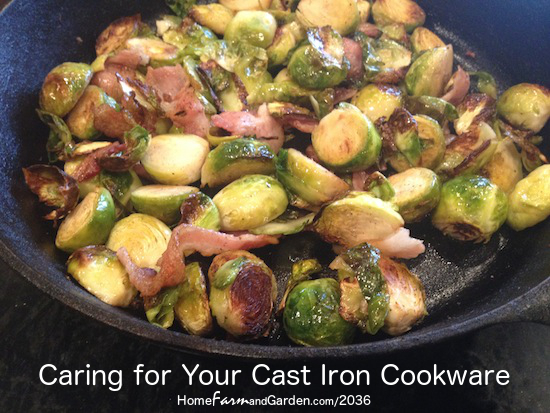 I promise, if you use these tips to care for your cast iron cookware, you’ll keep your pieces in great shape or be able to restore battered ones to pristine condition.